Our plastic card printing service is second to none! Choose from a unique range. This extremely effective way to help promote your business and attract new clients shouldn't be overlooked! Plastic cards and their customization features make them excellent promo tools. They’re commonly used as rewards cards, membership cards, gift cards, store cards, and more. The usage capabilities of these PVC cards will give your company, business, or brand a promotional boost as well. The feature that makes these particular custom plastic cards unique is that they can be cut into any shape you wish, as opposed to more traditional square shaped cards. These custom cards can be die cut into any shape you’d like, and we use CMYK digital printing to imprint your image and/or text onto the high quality material. For example, if you run a children’s party planning business, you can get creative and have the cards cut into superhero or princess shapes. 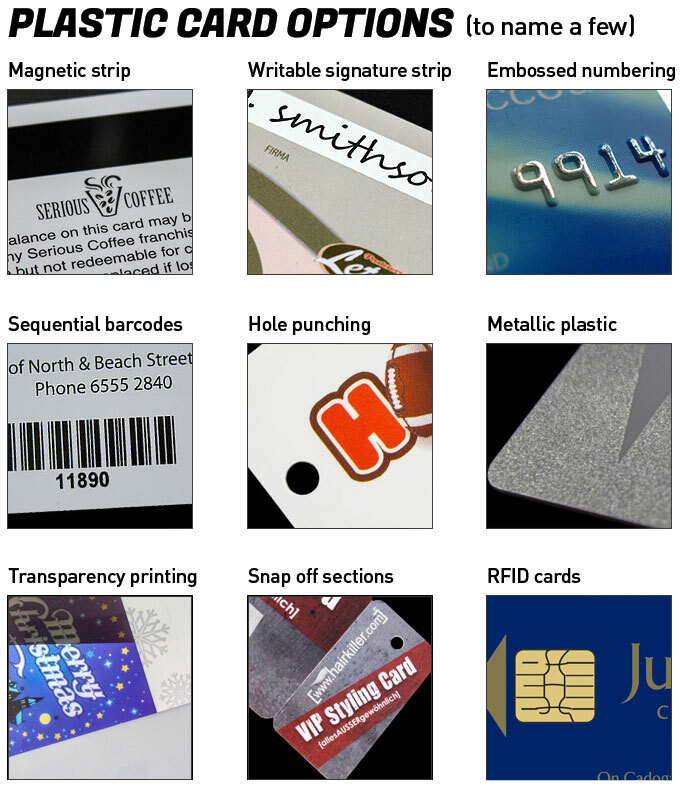 We also provide additional features that include sequential numbering, embossed cards, barcodes, and magnetic strips. You can also choose to have your cards made with metallic plastic, hole punching (to hang on a keychain), a writable signature strip, RFID cards, smaller snap off sections, and transparency printing. These membership cards offer effective promo strategies at an extremely cost effective price. These cards are commonly used as company ID cards, gift or discount cards, loyalty cards, company security passes, and more. Some of the businesses that commonly use these cards include, but are not limited to; clubs, associations, hotels, restaurants, retailers, wholesalers, VIP, gyms, schools, libraries, etc. You can have a company name, phone number, and/or logo printed on each card in your order, and there are various colours for you to choose from. So you can choose the colour scheme that best fits your business. Try combining these high quality cards with a custom printed lanyard to further increase your company exposure. When you hand your clients and/or customers these custom VIP cards, they will get the feeling that you run a trustworthy and professional company that appreciates their business. A custom shaped card will also help you generate new business, by attracting new customers with a uniquely shaped card. We only use quality materials when manufacturing our products. So you will never have to worry about your order of cards bending or breaking before you get use out of them. If you intend your order of cards to be gift cards or company security passes, you won’t have to worry about the numbers or sequence rubbing off of the card. Spending money needlessly on replacing worn out cards will never be an issue. Customer satisfaction is our number one priority. We want to make sure all of our customers are getting quality services and products, at the lowest possible prices. That’s why we have our price beat guarantee. If you find the same cards at a lower price from another Canadian supplier, we will drop our prices to beat theirs. Knowing exactly what kind of cards will be a good fit for your business can be a bit challenging. If you’re not sure where to start, you can contact us and we will be happy to help you create a card for your business. If you have a good idea of what you’d like, we can provide you with a quick online quote. There is also online instant messaging that is available in case you have any questions while you’re browsing through our products. We understand that sometimes, things look better in your head, than they look in person. Which is why we have a talented team of designers that will create a virtual sample of what your custom VIP cards will look like, before they go into production. They will send you the sample for approval. If you are not satisfied with the way your order came out, you can simply change it. You are guaranteed to be completely satisfied when your custom shape business cards arrive at your door.